Seefingan, like Seefin and Seahan, has a large megalithic cairn on its summit. Seefingan is the 96th highest place in Ireland. Seefingan is the second highest point in county Dublin. 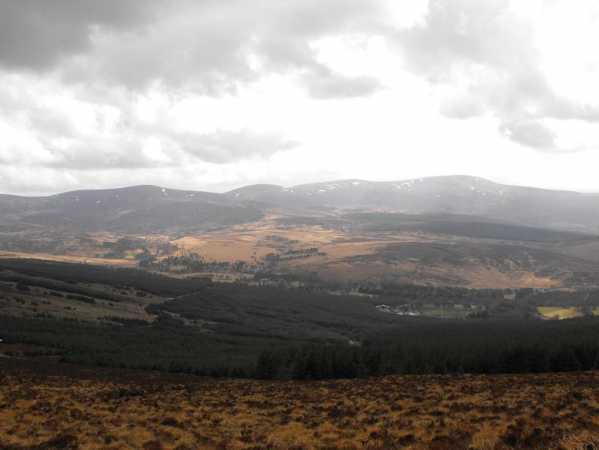 Picture from Homerclesse : Towards Mullaghcleevaun Ridge from Seefingan. Picture: Towards Mullaghcleevaun Ridge from Seefingan. I encorporated Seefingan as a Circular route of Seefin, Seefingan, Kippure and the Coronation Plantation. There a couple of approaches. My favourite is to park at the gates of the Kippure Estate and follow the track across the road. This eventually leads into heavy forest with a lot of deeply rutted tracks and felled trees. The best option is to head to the river bank (Athdown Brook) and climb up along the left side bank of it. A nice view behind you to the Coronation Plantation and the Mullaghcleevaun Range. Once you clear the line of trees on the left then it's simply a matter of heading a little north of west to the summit Seefin. Alternatively, head straight up the side of the summit till you reach Seefingan marked by a very interesting Cairn. Great views of the Blessington Lakes, the other hills of the West Wicklow range, south to Mullaghcleevaun and east to Kippure and Sugar Loaf. If you want it's possible to head to Kippure easily visible to the east with it's huge aerial and then head roughly 220 degrees back down following the Sraghoe Brook, to the Sally Gap and back to the car.